This was a group effort Mickey wrote the story, Niki took the Speculaas Shop photos and Mary made the Speculaas Cookies – stick to it – the recipe IS at the end. All Dutch children know that Sinterklaas (the name is a corruption of “Sint Nikolaas”) lives in Spain. Exactly why he does remains a mystery, but that is what all the old songs and nursery rhymes say. Whatever the case may be, in Spain he spends most of the year recording the behaviour of all children in a big red book, while his helper Black Peter stocks up on presents for next December 5th. In the first weeks of November, Sinterklaas gets on his white horse, Peter (“Piet”) swings a huge sack full of gifts over his shoulder, and the three of them board a steamship headed for the Netherlands. Around mid-November they arrive in a harbour town – a different one every year – where they are formally greeted by the Mayor and a delegation of citizens. Their parade through town is watched live on television by the whole country and marks the beginning of the “Sinterklaas season”. The old bishop and his helpmate are suddenly everywhere at once. At night they ride across Holland’s’ rooftops and Sinterklaas listens through the chimneys to check on the children’s behaviour. Piet jumps down the chimney flues and makes sure that the carrot or hay the children have left for the horse in their shoes by the fireplace is exchanged for a small gift or some candy. Speculaas cookie close up to read their names and see those prices in Euros. During the day, Sinterklaas and Piet are even busier, visiting schools, hospitals, department stores, restaurants, offices and many private homes. Piet rings door bells, scatters sweets through the slightly opened doors and leaves basketfuls of presents by the front door. How do they manage to be all over the Netherlands at once? This is thanks to the so-called “hulp-Sinterklazen”, or Sinterklaas helpers, who dress up like the bishop and Black Peter and help them perform their duties. Children who become wise to these simultaneous “Sint-sightings” are told that since Sinterklaas cannot indeed be in two places at once, he gets a little help from his uncanonized friends. 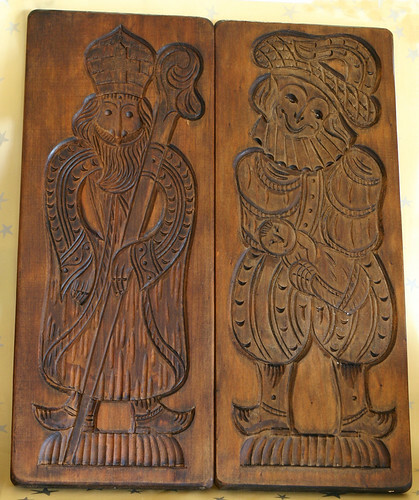 Happy Sinterklaas, the season of clemetines, speculaas, chocolate, gluhwein and lighthearted racist iconography. this recipe may seem to have a lot of flour – and it does in order to keep it from sticking to the wood cookie mold. You CAN add less flour without harming the outcome. If you don’t have a mold you can also roll these out and cut them in rectangles. 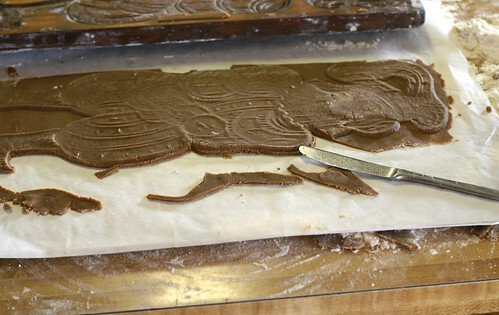 One more note – these made four of the cookie molds – 17″ in length! – you may want to start with a half recipe. 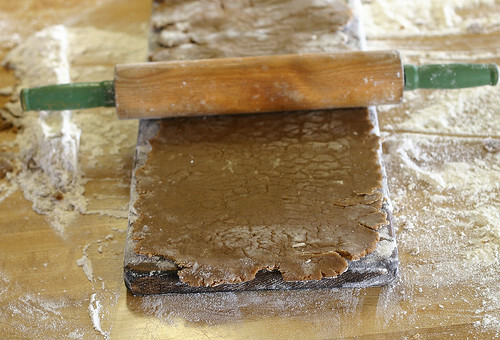 Roll out onto floured surface and cut rectangular or with cookie cutters. Bake at 375 until good and done – CRISPY IS KEY! Time varies to size of cut-out start at 8 minutes and go from there. Trimming the cookie before baking. Looks Delicious! Nice work on those speculaas cookies, Mary! I had some Sinterklaas nostalgia myself last night, only this time I was on the other side, putting stuff ready for Bob and Helga’s kids. I could already imagine the smile on their faces this morning when they saw all the toys, chocolotes, speculaas and clementines. It brought back the feeling from when I was a little kid. Thanks Niki! AND Thank YOU for the wonderful photos! Nothing says Happy Holidays like racism. Great story, great photos, and WOW! on the big ol’ cookies. What do they taste like? Gingerbread? Plus, I have to agree with Sinterklaas choosing Spain as his residence. So much wiser than living at the North Pole (or in Minnesota, for that matter). This project was SO MUCH FUN!!! That’s probably because Mary did all the work! Fred and I have been munching away at the practice cookies. They’re delicious! Wonderful with a cup of tea in the afternoon. GREAT story Niki!!! Such fun to hear the traditions of another country! When we lived in Belgium we put out the kids wooden shoes (we called them clompers)and they got filled with candy on St. Nicholas Day morning……so Sinterklaas remembers even the American kids! See, no prejudice in Belgium…and no recism either, I’m sure. er, that would be racism….. I LOVE this post, Mary!!! Great project and thanks for sharing the story (and the controversy). Ah, Sinterklaas and the lump of coal…. That is so awesome. Hmmm, maybe I have some available pattern in this house. I love those molds. So pretty. And to make this recipe takes some talent! Good job! I first learned about speculaas a few years ago from a show on the food channel. The molds are amazing, and I’ve actually met a few people recently who collect the molds (which are not easy to find here in Texas). What a beautiful way to celebrate the holidays. I hope they gain popularity here in the U.S.! 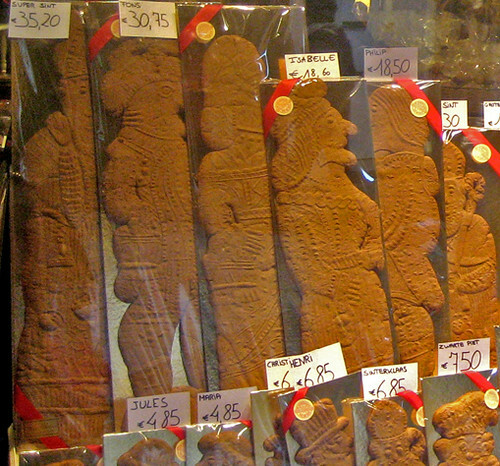 mmm…speculaas. Lekker!Hebben jullie ook pepernoten? First of all, Thank you so much for voting for me. I totally appreciate it. YOu know how much I enjoy your recipes and website. Thank you! It is fantastic how you enjoy our traditions. It is indeed a magical time! Congragulations with the speculoos! Everyone meet Linda – Niki’s mom and our home away from home mom! 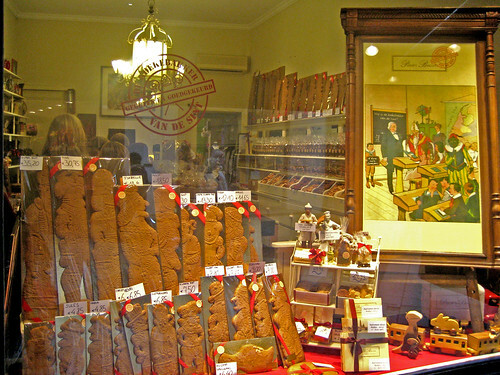 Speculoos – Speculaas – that is the question – Niki PROMISED me it was SpeculAAS – but I’ve seen both! Thanks for looking after my wild ones while they’re in Belgium! I’ve heard some wonderful things about your hospitality and your cooking! Looked it up on Wikipedia and the correct Dutch word is speculAAs. 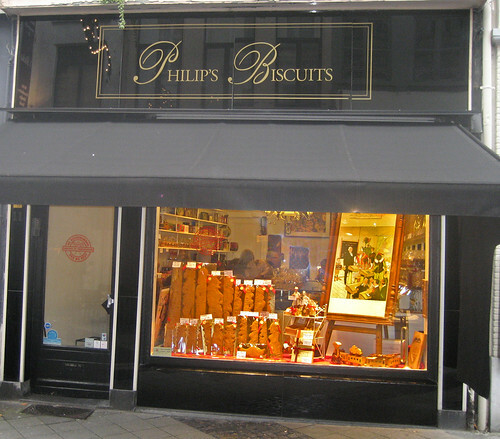 In Belgium it is also called speculoos sometimes but that would be more like a dialect. It sure is delicious! @ Laura: are you dutch yourself? It is great to see some dutch on this post! We do have pepernoten but that’s more common for the Netherlands. Also pretty tasty! @about speculaas..i thought dat speculaas is made with sugar and speculoos without. Or is that the same? Definately speculAAs! I grew up in a Dutch bakery. Your speculaas looks wonderful. I have a batch right now sitting in my fridge. As soon as I can get my hands on a mold (my sister has one that my father used in the bakery), I’ll post my recipe and we can compare. Whoo.. living in the Netherlands I surely had my share of speculaas this year! 😉 To top it off, we stocked up on speculaas & kruidnoten (the tiny ones) AFTER the celebration of sinterklaas, when everything was 50% off. 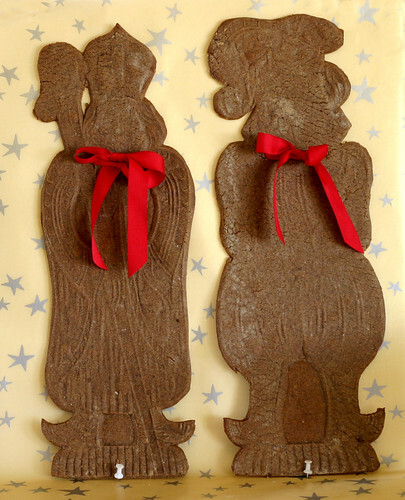 Wonderful story, I was looking for the recipe for speculaas and here you are. thanks so much. I have not had these cookies in about 16 years, that is how long ago I moved to America from West Vlaanderen. And also my mom always said that zwarte piet is black from the chimney. Makes sense to me… How come santa never gets dirty? That’s a good question… But does he climb through the chimney as well? He seems a little ‘big’ for doing that 🙂 Anyway, you don’t have to think about it too much, just believe what you believe in!